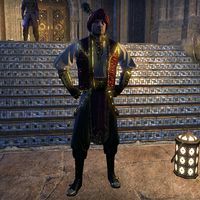 Cosh is a newly arisen merchant lord of Abah's Landing. During Forever Hold Your Peace, you'll discover that he has previous history with the Thieves Guild. After infiltrating the Iron Wheel Headquarters in the No Shira Citadel. You can listen in on his meeting with some nefarious individuals, while taking the opportunity to steal his documents. Cosh: "Good. Then I shall make your documents disappear." Cosh will then walk over to the where the stack of papers once were. Cosh: "What? My papers were here! Did they fall behind the …." Cosh: "I'll attend to that after my meeting with Chief Inspector Rhanbiq. Do remember who holds your reins." After some sneaking around, you can witness the tail-end of his talks with the Chief Inspector. Cosh: "I can locate Magnifica's Falorah's dowry. I can return it to you within the fortnight." Chief Inspector Rhanbiq: "And what is your interest in the matter, exactly?" 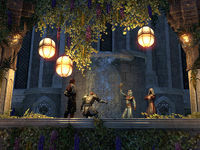 Cosh: "The Iron Wheel must leave Hew's bane. You're simply bad for business." Chief Inspector Rhanbiq: "If you recover Magnifica's Falorah's dowry, I can guarantee our return to Taneth." Cosh: "There is a another minor request … hardly a trifle. Perhaps we can discuss it over drinks?" Chief Inspector Rhanbiq: "I do not drink." Cosh: "Then I shall take your share. Come, an office is no place to do business." When the Guild hears of Cosh and Magnifica Falorah's upcoming wedding, they decide to crash it to flush out former Guildmaster Nicolas and reveal his connection to Cosh. Once Zeira has arrived in the Palace Grounds, Chief Inspector Rhanbiq will present Cosh to the guests, as per Taneth tradition. Chief Inspector Rhanbiq "Everyone, I require your attention!" Zeira: "This is it.—Stay close—let's see if Nicolas makes an appearance." Chief Inspector Rhanbiq "It's an honor and a privilege to introduce our host for the evening. May I present the impending husband of Magnifica Falorah … Lord Cosh!" Cosh: "Please, eat and drink your fill! Soon, I shall speak to you not as a humble merchant, but as a noble of Taneth!" After learning the truth and trying to convince Magnifica Falorah, you can witness the marriage ceremony. Rhanbiq will begin to officiate. Chief Inspector Rhanbiq: "Today, Lord Cosh of Abah's Landing joins with Magnifica Falorah, the Jewel of Taneth." Chief Inspector Rhanbiq: "It is my honor, as a duly appointed officer of the Iron Wheel, to officiate their union." Zeira will then rush in to stop the ceremony, followed closely by Falorah. Zeira: "Stop! There is no honor in this union!" Chief Inspector Rhanbiq: "What is this? Guards!" Cosh: "Zeira? You're alive? I … that is … what is the meaning of this?" Magnifica Falorah: "More importantly, why do you have the desecrated remains of my ancestor?" Cosh: "There must be some mistake!" Magnifica Falorah: "Chief Inspector Rhanbiq, take everyone into custody. I want this mess sorted." Chief Inspector Rhanbiq: "Iron Wheel, secure all exits! None shall leave the palace grounds. Question everyone here. Be thorough!" Cosh: "Falorah, my darling—I've been framed! I implore you to reconsider." Zeira: "Give it a rest, Nicolas. Whining doesn't suit you." Chief Inspector Rhanbiq: "Quiet, thief! You'll have enough time to bicker from inside your cell. Take them away!" Chief Inspector Rhanbiq will arrest both Nicolas and Zeira.